Quite a charming release, no earth-shattering innovations, no trips to the moon on gossamer wings although Freyer can certainly fly within his chosen orbit. "Dean Martin looks and Sinatra voice" says the blurb. I'm not too sure about the looks but possibly Dino may have inspired Freyer's two original songs - Must be Love or Else I'm Drunk and Tanked as a Fish, Buzzed, Bombed and Blitzed!Who said the art of lyricism is dead? He also wrote a new lyric to Yardbird Suite as well indulging in a vocalese chorus based on Bird's solo. Freyer tips his Fedora to Frank with Bop Goes My Heart, That Old Black Magic, Lean Baby, Begin the Beguine, Stardust and Goodnight my Love. The album opens and closes with this latter tune which features a backing vocal by Dannielle DeAndrea giving it a vintage forties feeling. The arrangements are excellent and the solos fit the mood perfectly. Jeff Elwood's tenor particularly poignant on Promise me You'll Remember. However, the $64,000 question is, "Why buy this when I've got most of them by Sinatra?" Well, speaking as Ol' Blue Eyes number one fan, even I must admit that Freyer has the edge when it comes to swinging. If anything, he's more akin to Crosby and Bing almost always got the nod in that department. Balladry of course is a different matter altogether. 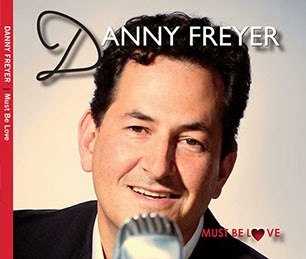 Danny Freyer - Must be Love is available on Blue Bend Records. Danny Freyer (vocal); Matt Politano (pno); Roger Shew (bs); Evan Stone (dms) + Jeff Elwood (saxes); Tony Guerrero (tpt/arr); Mark Visher (clt); Ben Devitt (tmb); Phil Parlapiano (acc); Dannielle DeAndrea (backing vcls); Alira strings (one track only).